The nationwide Cyclospora outbreak has now sickened 557 people in 19 states, according to the Centers for Disease Control and Prevention. Thirty-five people have been hospitalized in this outbreak. 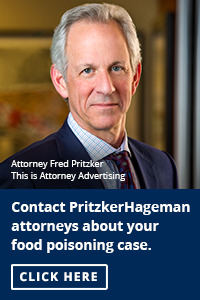 The case count by state is: Texas (225), Iowa (153), Nebraska (86), Florida (28), Wisconsin (14), Illinois (11), Arkansas (7), New York City (5), Georgia (4), Kansas (4), Missouri (4), Louisiana(3), Minnesota (2), New Jersey (2), New York (2), Ohio (2), Virginia (2), California (1), Connecticut (1), and New Hampshire (1). 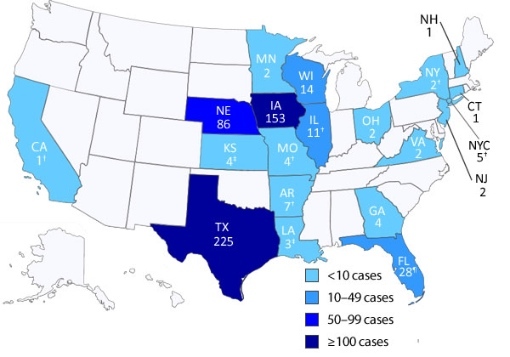 Some of these counts include people who acquired the infection in other states, and there may be one travel-associated case. Most of the illness onset dates have ranged from mid-June through mid-July 2013. The outbreak in Iowa and Nebraska has been linked to imported Taylor Farms de Mexico salad mix sold to customers of Olive Garden and Red Lobster restaurants. Officials are not sure if all of the cases are related to this product and do not know if all of the cases are part of the same outbreak. Taylor Farms de Mexico has stopped shipping product to the U.S. until the FDA approves. Cyclosporiasis, the illness caused by the Cyclospora parasite, is manifested in watery and explosive diarrhea, loss of appetite, weight loss, stomach cramps, fatigue, nausea, and vomiting. It is most commonly found in tropical and subtropical areas, but outbreaks have occurred in the U.S. and Canada through imported produce.